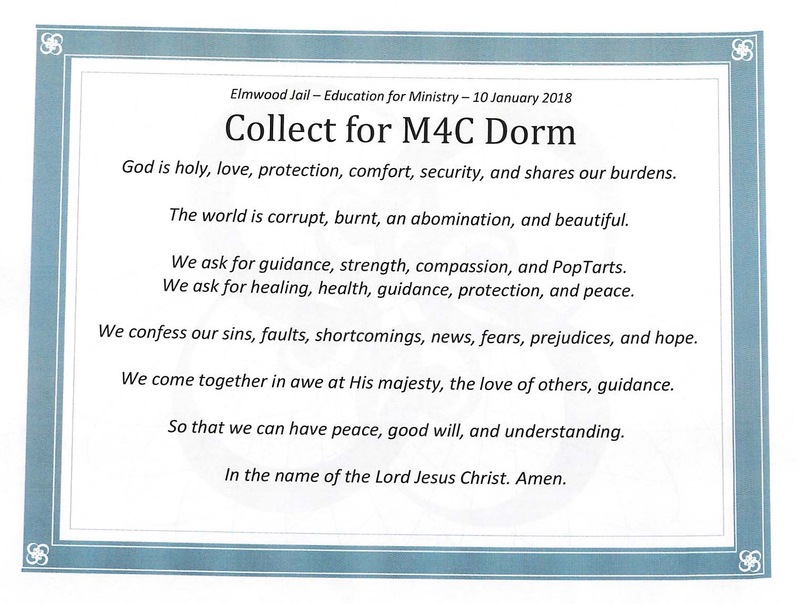 In Week 16 of our Education for Ministry (EfM) 36 week seminar, the students write a Collect together. A collect is a prayer meant to gather the intentions of the people and the focus of worship into a succinct prayer. In the Week 16 exercise, EfM prompts us with the first few words of each line and the students fill in the rest. By writing their own Collect, students learn the difference between kinds of prayer: Petition, Intercession, Penitence, Thanksgiving, and Adoration. I lead three EfM seminars a week, two at at Elmwood Jail in Milpitas and the third at St. Andrew’s Episcopal Church (all in the Silicon Valley). My Co-Mentors Joel and Diane and Karen and I are all Accredited Mentors. After each group wrote their own Collect, I read them the prayers written by the others. God is holy, love, protection, comfort, security, and shares our burdens. The world is corrupt, burnt, an abomination, and beautiful. We ask for guidance, strength, compassion, and PopTarts. We ask for healing, health, guidance, protection, and peace. We confess our sins, faults, shortcomings, news, fears, prejudices, and hope. We come together in awe and wonder at His majesty, the love of others, guidance. So that we can have peace, good will, and understanding. God is wonderful, loving, father, strong, life. The world is a mess, suffering, needing peace, capable. We ask for peace, mercy, love, hope, freedom, safety, protection. We ask for food for the hungry, a house for the homeless, peace for those in war-torn countries, and health for the unhealthy. We confess sin, misgivings, our love, ignorance – lack of knowledge. We give thanks for life, families, safety, health, our EfM Mentors, friendships, and Honey Bun pastry. We come together in awe and wonder at new learning, every day, God’s presence at Elmwood Jail. So that we can have love, understanding, faithfulness. God is love, healer, generous, compassionate. The world is sick, poor, in need, progressive. We ask for health, healing, open hearts and minds. We ask for abundance for the poor, courage for leaders, wholeness for the sick. We confess our prejudice, limitations, slowness. We give thanks for those who came before us, healers, saints, new babies and parents, courageous leaders. We come together in awe and wonder at a new year, God’s presence in our lives, grace. So that we can be fearless, and the sick will be comforted. In the name of our healing Father. This jail-based EfM program is supported by the Correctional Institutions Chaplaincy, the Episcopal Diocese of El Camino Real, St. Andrew’s Episcopal Church (Saratoga, California), and the University of the South – School of Theology.